The right hand rule is a visualization technique used to determine the correct direction of a vector resulting from vector cross-product multiplication. 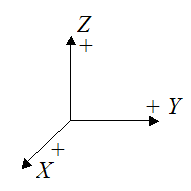 It is based on the following sign convention for an XYZ coordinate system, as shown below. For the XYZ reference frame shown above, the positive direction of the three individual axes is defined as shown. This choice of positive direction for these axes is important because vector cross-product multiplication is based on it. Therefore, it is important to use this same sign convention when using vector cross-product multiplication, and when solving equations derived from vector cross-product multiplication. The Euler equations of motion are an example of equations that must be solved using the sign convention shown above. If you use another sign convention, you might get the wrong answer. For example, the sign convention shown below has a different sign convention than the sign convention shown in the figure above. So it may give you the wrong answer if you use it when solving equations involving vector cross-product multiplication. So don’t use it! where A, B, and C are vectors. Join the tail of vector A to the tail of vector B. The direction of vector C is then determined by curling the fingers of your right hand in a direction that “sweeps” from vector A to vector B. 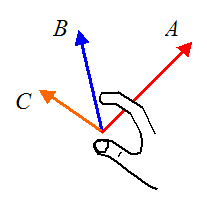 The resulting direction of your thumb denotes the direction of vector C.
Note that vector C is perpendicular to vectors A and B. To show an example of applying the right hand rule, consider the cylinder shown below which has a force Fp acting at point P on the cylinder. The radius of the cylinder is r. We wish to determine the moment of the force Fp about point O. The sign convention shown below has the positive Z-axis pointing out of the page. It matches the sign convention shown in the first figure. 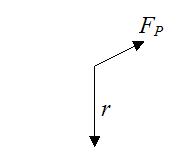 The moment of the force Fp about point O is given by the vector cross product r×Fp, where r is the position vector from point O to point P.
Now, join the tail of vector r to the tail of vector Fp, as shown below. 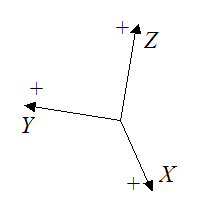 Using the right hand rule, the vector r×Fp is pointing out of the page in the positive Z-direction. Alternatively, we can also determine the direction of r×Fp by directly evaluating the vector cross-product r×Fp. This avoids having to use the right hand rule, since the direction is automatically determined by evaluating the cross-product. where the radius r = 1.5, and J is the unit vector pointing in the positive Y-direction. where I is the unit vector pointing in the positive X-direction. where K is the unit vector pointing in the positive Z-direction. Therefore, r×Fp is pointing out of the page, in the positive Z-direction. This is the same result as before. 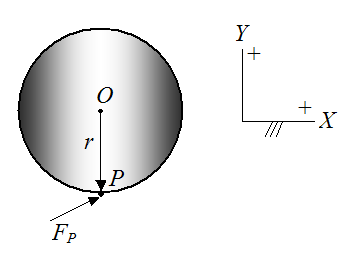 You can also determine the direction of r×Fp by imagining which direction the force Fp tends to rotate the cylinder. Upon curling the fingers of your right hand in this direction, your thumb will also point out of the page (in the positive Z-direction). This is a slight variation on the right-hand rule, but it gives the same result. Which method should be used depends entirely on your personal preference. Conversely, if you know the components of the angular velocity vector (wx, wy, wz), or angular acceleration vector (αx, αy, αz), the direction of spin is given by the right-hand rule. The right-hand rule also applies to the moment of a force vector. To determine the correct direction for this vector, you can use the right-hand rule. However, as shown in the example above, if you are calculating this vector directly using cross-product multiplication (i.e. Mo = r×Fp), then you do not need to apply the right-hand rule to determine its direction. This is because the resultant vector (calculated from r×Fp), is automatically pointing in the correct direction.